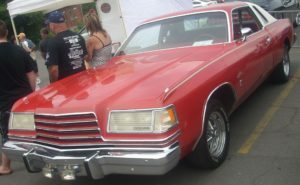 The Dodge Magnum name was originally launched in 1978 as an extension of the Chrysler brand in response to changing rules for the upcoming NASCAR racing season which would prevent the Dodge Charger from competing. NASCAR legend Richard Petty originally favoured the Magnum in the opening stages of the 1978 season however he found the handling difficult to control and switched to a Chevy after just 7 races. Despite this, the Magnum has found success, helping Kyle Petty (Richard’s son) win his first race and he stuck with them for a further 5 races before abandoning them due to extensive and irreparable damage. As of 2008 there were only two known NASCAR Magnums in existence, both in good condition and one resides in the Talledega NASCAR museum for fans to view. From such exciting beginnings the Magnum name was passed from car to car including the original ‘Dart’ sold in Brazil and then as a vehicle in itself sold in Mexico between 1981-88 before being dropped as a name all together in 1989. The Magnum model name was brought back in 2004 as a station wagon version of the Chrysler 300 with some subtle body changes and built in Ontario, Canada. In 2005 the SRT-8 – a performance focused model was launched and sold as the 2006 model of the vehicle. With a 6.1 L engine and over 425 break horse power it won the Canadian Car of the Year Contest in 2006 as the ‘Best New Modern Muscle Car’. With a 0-60mph time of just 5.1 seconds and 0-100 mph in 11.7 seconds it’s easy to see why. Outside of the USA, the Dodge Magnum was sold under the name ‘Chrysler 300 Touring’ and was essentially the same with slight design tweaks and the option of a 3.0L CRD Turbo Diesel engine. As the Dodge Magnum is at present discontinued owners have found buying replacement parts, and especially custom parts such as wheels to be difficult to obtain however there are manufacturers producing high performance parts to match the high performance of the SRT-8.